“All of us would prefer to get rid of Ahmadinejad, the modern Haman, without war,” President Peres told Rabbi Ovadia Yosef in his Sukkah. 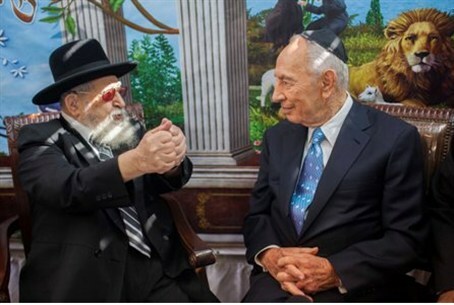 “All of us would prefer to get rid of Iranian President Mahmoud Ahmadinejad, the modern Haman, without war,” President Shimon Peres told former Chief Sephardi Rabbi Ovadia Yosef in his Sukkah in Tuesday. Peres also put in a plug for the Obama administration. Haman was the second in command to the king of Persia – ancient Iran – who conspired to kill all the Jews in the empire but eventually fell into his own trap and was sentenced to death by the king, along with his co-plotters. In his annual visit to the Sukkah of Israel’s current and former Chief Rabbis, the President told Rabbi Yosef, spiritual leader of the Shas party, “Harsh economic sanctions must be placed on this most corrupt regime in the world.” We need a wide coalition to put pressure on Iran. The rabbi and the President also discussed gaps between the rich and poor in society. “Despite the relatively good economy in Israel, we have to continue to work to reduce the social gaps and use a significant amount of income from gas and oil royalties for education and the poor sector,” President Peres stated. In his visit with Chief Sephardi Rabbi Shlomo Amar, Peres praised the rabbi for his work in promoting unity among Jews.